When I sat down to play Anthem at EA's recent preview event, it wasn't my first time taking control of a Javelin. I had participated in the Closed Alpha a few weeks prior, but what little I played was only enough to get me used to some of the game's control quirks. It wasn't a deep dive by any means. 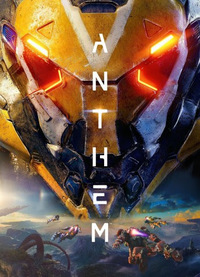 Admittedly, I hadn't been keeping track of Anthem's development - my main interest in the title stemmed from the fact my roommate was enamored with the concept - and as such, much like everyone else in my little squad during the event, I was heading in (mostly) blind. Just to get it out of the way, while there are certainly parts of Anthem that seem to be ripped wholesale out of Destiny - armor and weapons drop in geometric shapes, colored White/Green/Blue/Purple or even Gold - they are two very different games. Anthem's Javelin classes all feel distinct in the ways that Destiny's Titan/Hunter/Warlock trio could only hope to be, and that's not even getting into the fact that Anthem's Javelins can fly, where at most Destiny's Guardians can float. During my hands-on, I got the chance to try out 3 of the game's 4 classes of Javelin - the Ranger, the Colossus, and the Storm. Of the 3, the Ranger is probably least unique of the bunch. It comes equipped with grenades, its ultimate ability is a barrage of rockets, and its melee makes use of a baton. The Colossus, on the other hand, looks and feels like a proper tank in motion. One of the classes' unique weapons is a minigun, which lets you rev it up before firing by holding down either the trigger on the controller, or the right mouse button on PC. It has access to a shield it can use even mid-flight, a mortar hooked to its shoulder, and its melee can transform into a devastating AOE slam once in the air. A lot of what players will be able to test with the newly released VIP demo was available to press during our second session, including a story mission (with some light puzzle-solving), and a few side missions that didn't quite deal with the narrative. Some of what I played was interesting, but my overall impressions were rather mixed. 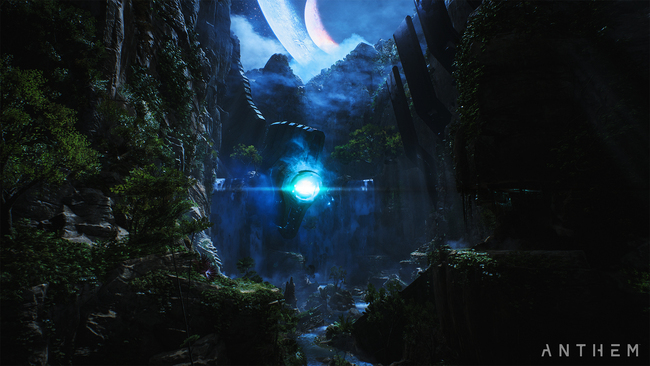 I feel like I wanted to enjoy Anthem more than I did, and despite some small puzzles here and there, I couldn't help but feel that the game didn't have enough variety in the content that they had to show off. An interesting story might have helped contextualize things a bit, but even that can only do so much when you're fighting the same enemy types over and over. 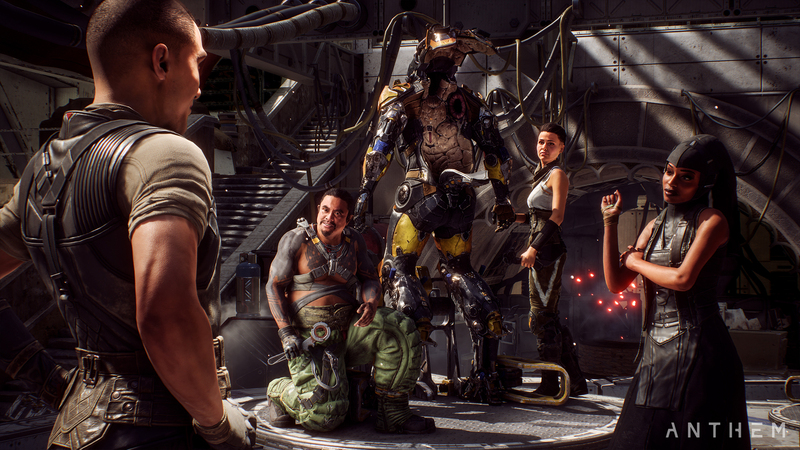 Anthem's Javelins feel great to play with, but I'm not sure if the game's content is being designed around their skills as much as it could be. One moment you're zipping around, gathering Echoes to unlock a door, but another you're edging your way through an underwater cave in what is easily the least fun I've had playing a game this year. Whoever thought that the underwater controls were good in the first place was wrong - the fact that the only examples I saw of them were in cramped, dark, caves makes things even worse. I don't know a single member of the press that didn't get lost whenever they had to submerge their Javelins. Thankfully you don't battle enemies underwater, because if you had to contend with combat while also trying to keep your sense of direction, I might be ready to drop the game then and there. It remains to be seen how the rest of the game fares come launch, but one thing is for sure - Bioware has a lot to prove. While the main studio might not have been the ones to produce Mass Effect: Andromeda, all eyes are on Anthem thanks to its release. I worry how the full game will stand up to the public's assessment, and I can only hope that the build that we managed to play was older than was let on. There's a lot the game needs to fix come launch - and I'm not sure if there's enough time to do so.